Elliana Broscious, eight, had never touched a cello, but was making a pleasant sound by the end of an impromptu lesson. Violinist Krista Bennion Feeney played "Somewhere Over the Rainbow"
after showing aspiring violinists a few points at Tippet Rise this week. TIME SPENT with a brilliant musician can be life-altering for a child with a song in her heart. Such is the case at the Tippet Rise Art Center family concerts, when world class musicians take children under wing to teach instrument basics and encourage curious kids to study music. 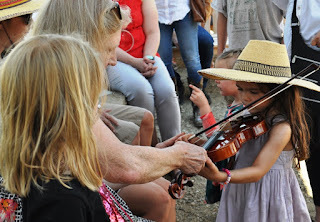 to properly hold the bow at an "Instrument Petting Zoo." We took my great-niece, Elliana Broscious, and her brother Connor to a recent concert at this inspiring multi-million-dollar venue near Fishtail, Montana. In blending art and music with nature, Tippet Rise is gaining an international reputation for originality, excellence, beauty and daring. Elliana, 8, hadn't decided on her instrument of choice yet. Her older brother, Connor, 13, is studying both piano and trumpet. So on a lovely sunlit Sunday, we strolled from the Center's cafe to the Tiara acoustic shell to see if Elliana might choose her instrument at the "instrument petting zoo." Enter, the cello! Chamber Ensemble, both in New York, took time to encourage youngsters. THE FREE FAMILY concerts are designed to showcase Tippet Rise guest artists in an informal venue. Musicians work with children, sharing their love of their instruments, telling anecdotes, performing short pieces to hold the attention of young, fertile, fast-moving minds. ELLIANA FIRST spent a half hour with amiable cellist Myron Lutzke, who joined other players from New York's renowned St. Luke's Chamber Ensemble. Lutzke, a soft-spoken middle-aged man who adores his 18th Century instrument, showed Elli and other aspiring musicians how to hold their pint-size cellos. Gently, he instructed them on positioning their hands on bow and strings. "Not too far up," he urged. "Keep the bow near the bridge for the best sound -- to avoid a scratchy tone." As he worked with the children, they listened and improved, learning how to make sounds more vibrant, stationing the bow near the bridge, moving the bow "down" and "up." "Look how quickly Elliana is picking it up," beamed Lutzke. "She has potential." When told the day could be life-altering for her, he smiled, "That's the goal." Elliana's mother, Aurora Pierson-Cosgriffe, said the experience "ignited a joy in Elliana for the cello. I see an eagerness to learn. It fueled her passion for music." positioning of hands, and how to hold the bow. Twinkle Little Star" to enraptured ears, and Stewart Rose instructed youngsters on holding the French horn in place, pursing the lips and making a sound. He later played cuttings from famous movie themes -- "Star Wars" and "Indiana Jones" -- to illustrate how music delights us and permeates our lives. framed by her beloved piano. beloved song from "The Wizard of Oz." My own musical exposure began as a 15-month old when I was assisted up onto a piano seat to plunk a tune. Music surrounded me. Both my classically trained mother and her mother played beautiful piano. Daddy played trumpet, and piano on black keys by ear, like Irving Berlin. While I learned classical music, my exposure included other genres: ragtime, jazz, show tunes, folk and gospel. I segued from piano to organ, saxophone, clarinet, flute, guitar and violin. My sister Peny, played several instruments, too, including piano, viola and trombone. Other siblings studied; ours was a house of music. Friday jazz at the Handlery's 950 Lounge is always a packed house. UP NEXT: On another musical note, the Handlery Hotel in San Diego is home to a wonderful tradition: Friday night jazz. We take you inside this family run hotel, which offers delightful free Friday concerts with some of Southern California's finest jazz musicians. Comfy seats, intimate concert space and great prices on happy hour drinks and appetizers await. Remember to explore, learn and live and catch us Fridays when we post for each weekend, a novel look at travel, art, adventure, nature and family. Wonderful to involve children in this extraordinary enterprise called Tippet Rise. We are coming from England for the final weekend. Thrilling third season. The UK knows about the venue! This blog is a true find. Fresh, current, often funny and whimsical. "Where is Cookie" indeed? A true global spirit. Fun fun fun.....great story, Cookie. I, too, had great childhood influences. Go, soar,fly. 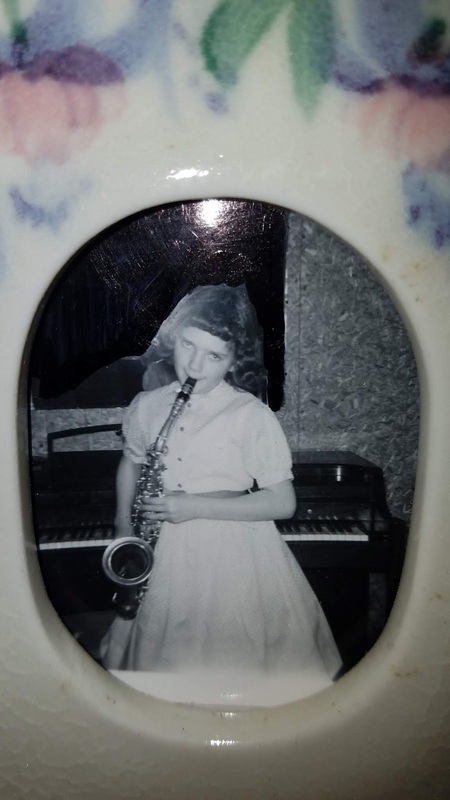 I taught my kids and grandkids at an early age, and exposed them to a variety of instruments. Decades later, both play music -- one professionally with the New York Philharmonic. Those early exposures and influences: priceless! This story made me smile. Hope she becomes a female Yo Yo Ma! Happened upon this delightful piece enroute to Tippet Rise for our first concert. Excited at all the ripples in the Tippet Rise stream, educational outreach among them.